These tiny crunchy little seeds pack a healthy punch! If you’ve never tried them, give it a shot. According to research, they were a diet staple of the Aztecs and Mayans and are supposed to provide sustained energy. Not to mention, only 1 tablespoon has 150% of your daily recommended value of Omega-3! The suggested serving size per day is only 1 tablespoon and it’s so easy to find ways to sneak them into your food. 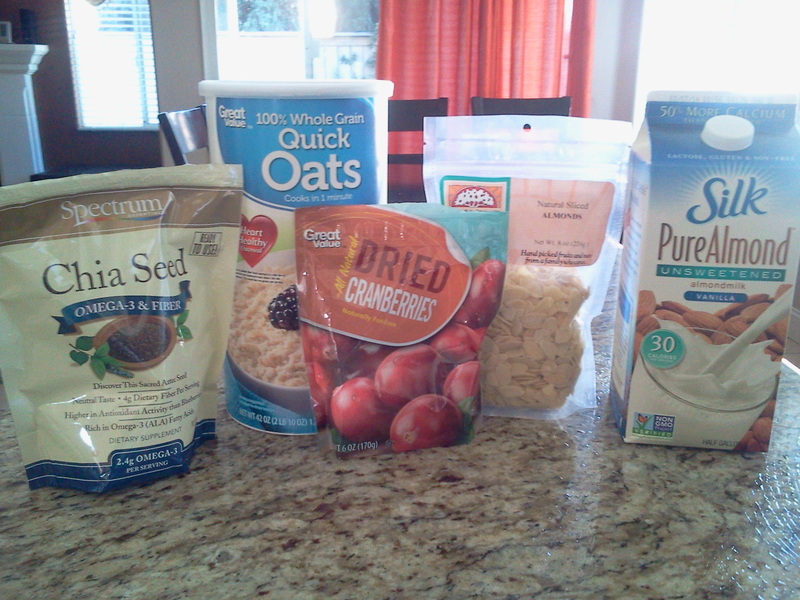 My personal favorite way to eat them (Monday-Friday this is my go to breakfast) is oatmeal! I’ve tried to cut back on sugar consumption in the morning time (at least during the week), even though I love a sugary breakfast. If you absolutely cannot live without it, you can add sugar to this but it’s totally optional, and the dried cranberries have sugar in them and add just the right amount of sweetness. And I swear this breakfast starts my day off right. Put oats and water into a microwave safe bowl and stir. Heat in the microwave for one minute. Add the rest of the ingredients and stir. 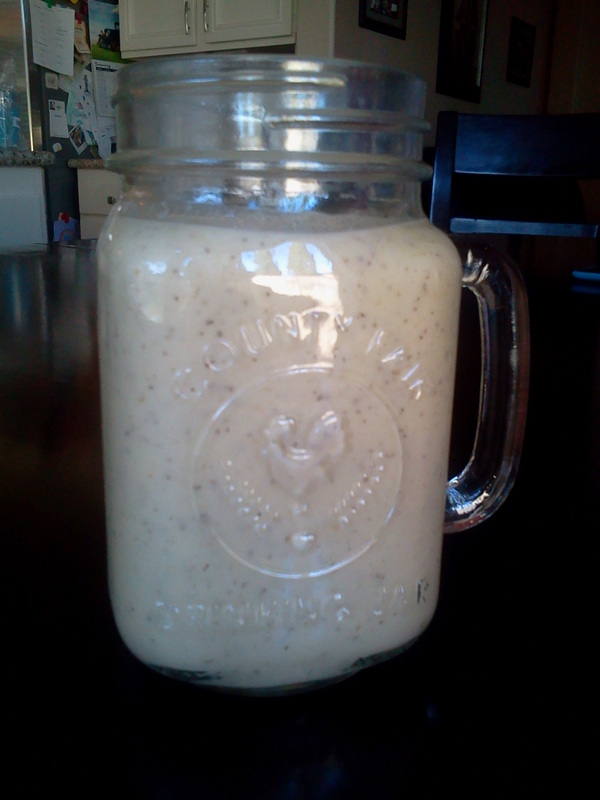 Another great way to incorporate chia seeds into your diet is in smoothies. This is a recipe that is definitely kid approved. 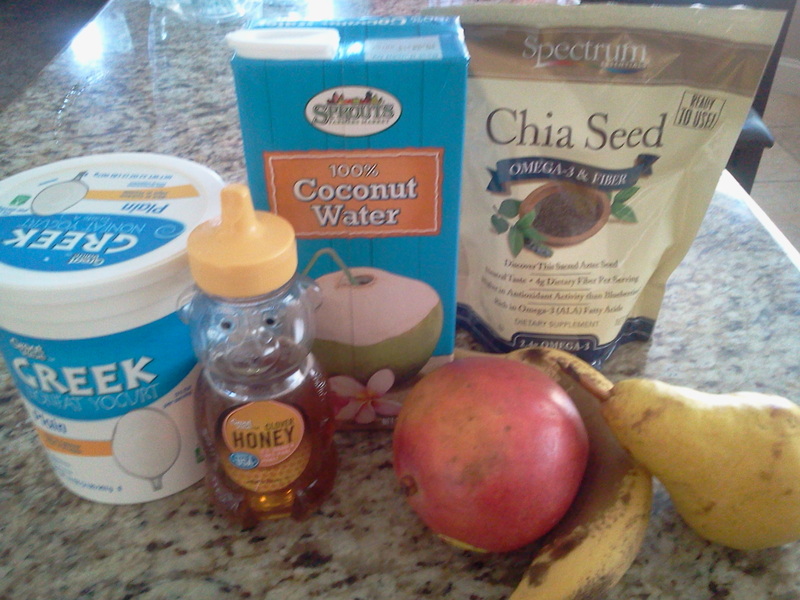 Put all ingredients into a blender and blend on high until smooth. 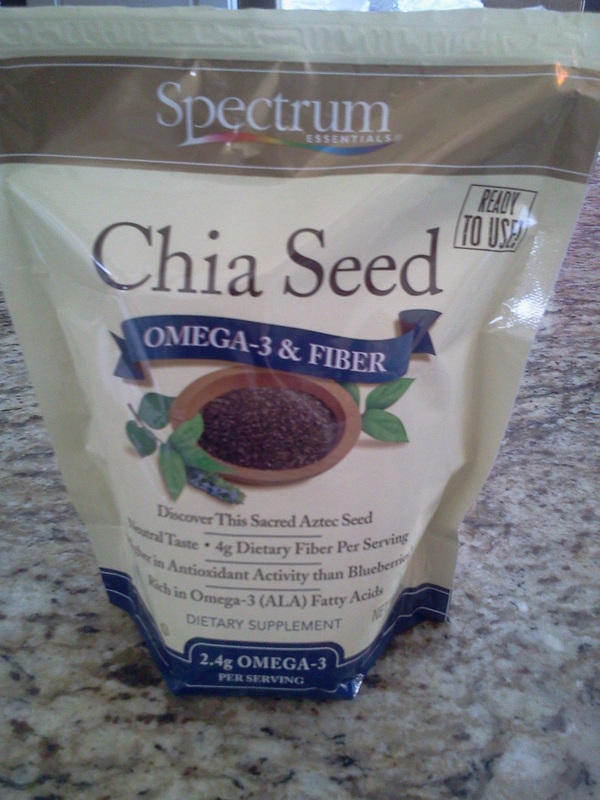 Feel the power of Chia course through your body and start your day like a super hero! Although I’m not a beauty blogger, I still think this post qualifies under the “Jenuinely Homemade” theme, as it’s done at home! So, a little break from the food posts, to pass on a money saving tip. In the beauty form. Got gray? Unfortunately, I do. After I turned 30, that’s when I decided I needed to handle my business. Although I don’t really think it’s my age that was the cause, but more specifically, THIS person! That’s my third child, and she’s a handful! Each and every child is so different but in my experience, the last one gives you the most trouble. I joke that every time she does something bad, a gray hair shoots out of my head. Kidding aside, I think it may actually be true. 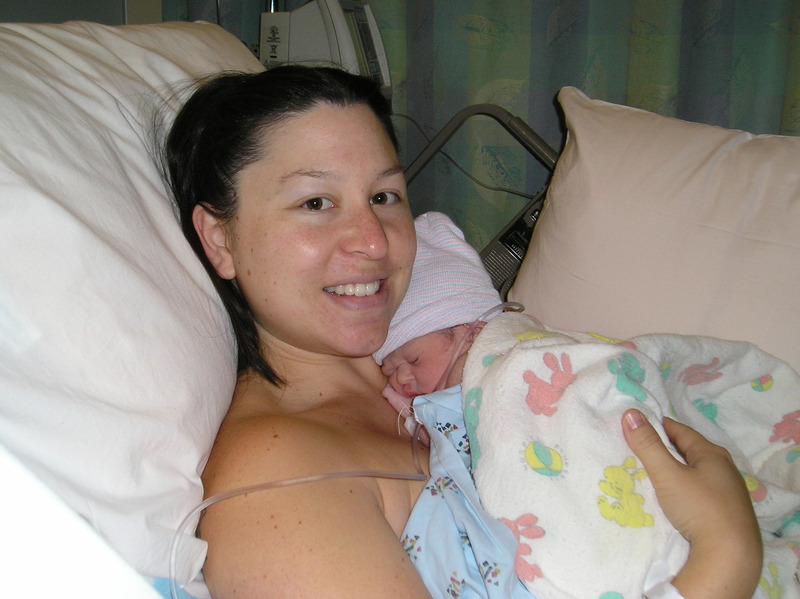 So this is me and #3 the day of her birth. Look at my glorious natural dark hair. I miss it! She was a great baby, but once she hit one year old, oh my. (See first picture). Ages 1, 2, 3 and 4 for her, and us, have been tough. Moms, I KNOW I’m not alone in experiencing this, right? Please tell me I’m not alone! So then the gray arrived, and dye it I must! 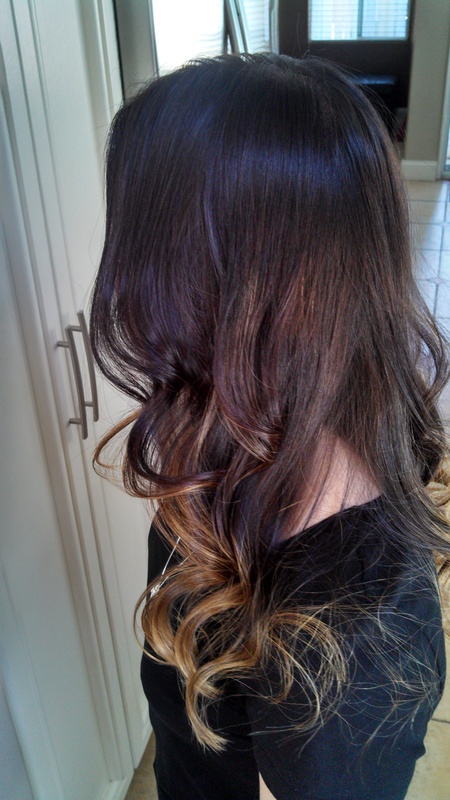 I have had a professional color it in the past but it’s just so expensive to maintain. And if you have to dye your roots frequently like me (about every 4 weeks), then finding a less expensive alternative is necessary. Store bought “box” dye can range anywhere from $5-$12, depending on the brand, and in my experience, doesn’t last as long. I’ve noticed grays coming back within a few days of using that stuff. So I tried these products and I’m glad I did. It’s stronger and pretty easy to use. On a side note, I’m not a licensed cosmetologist. Just a mom with gray looking to save. 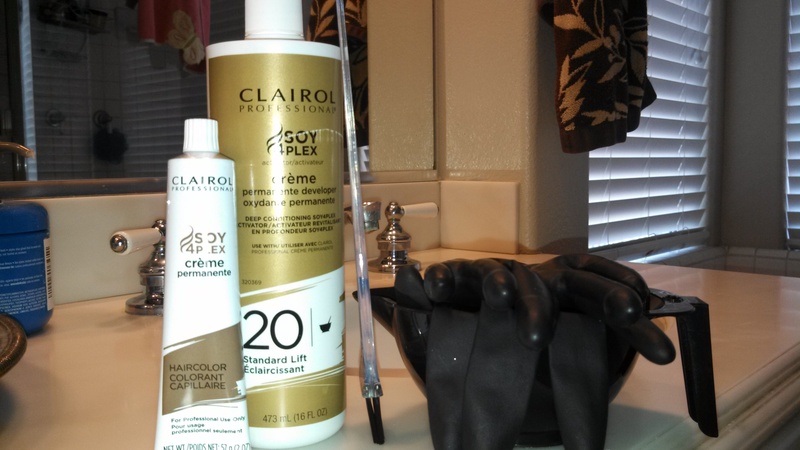 So the actual color, Clairol Professional Crème Permanente, cost me about $6, and I can use it at least THREE times to dye my roots. The developer was around $8 and I don’t know if I’ll ever run out of the stuff. All the other items (gloves, brush and bowl) cost me less than $5 and can be used countless times, as they are washable. See the savings? You can find all this stuff at your local Sally Beauty Supply. 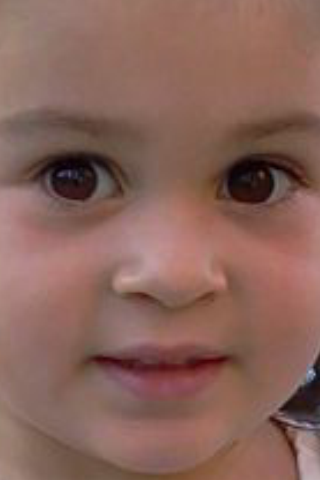 Now, I just want to finish by saying I do love that little girl very much. And although I don’t like my gray hair, and I do care, it’s an easy fix! Good luck gray haired moms! We need it! 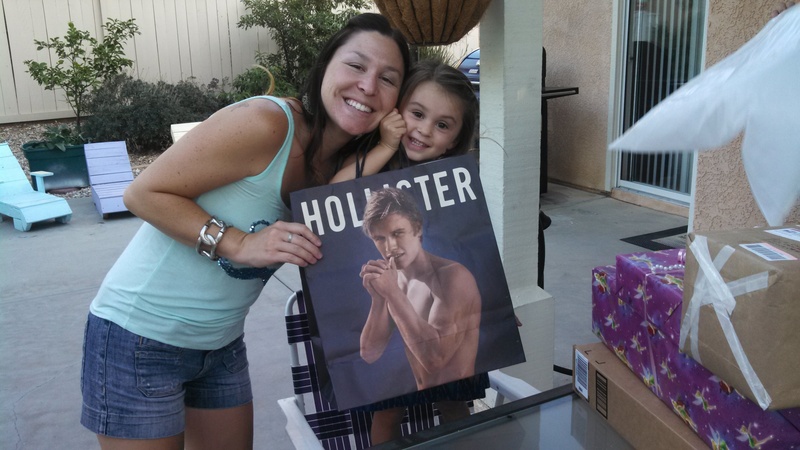 Her 4th birthday and she thought the boy on the bag was cute. We’re in trouble….. So this post has nothing to do with Irish food. I just wanted to say good morning in a less traditional way. So top O the morning to ya! This should give you a hint that I’m going to talk about breakfast. On Saturdays in my house, my family looks forward to a nice home cooked breakfast. It’s our one day that we are not rushed to go anywhere or do anything (except during softball season). 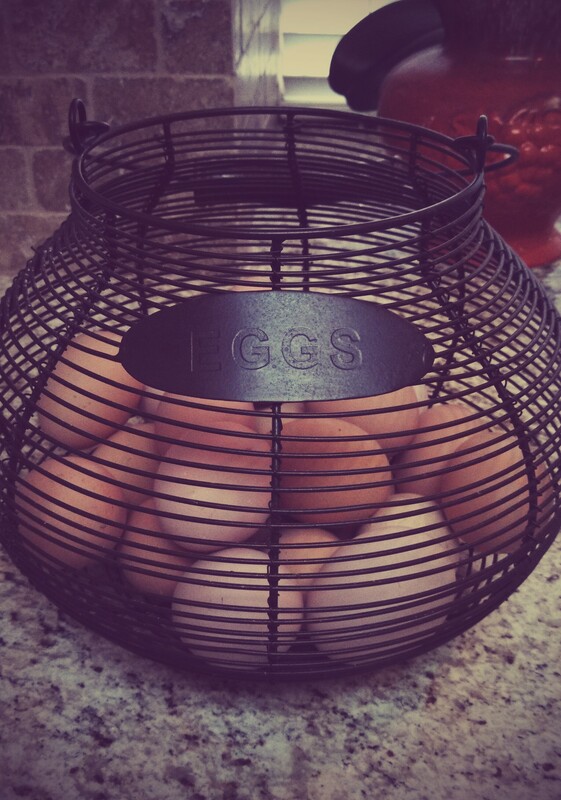 Look at those “farm” fresh eggs! Beautiful! On a recent Friday when I was at the grocery store, I found some great looking chicken apple sausage links on manager’s special. Only about $2 and I figured I could use them to make some kind of yummy Saturday breakfast. We also have an abundance of brown eggs because we do the whole backyard chicken thing. So I get fresh eggs on a daily basis. With this in mind, I thought of hash! This breakfast turned out to be so good, (and pretty looking too!) so I wanted to share it with you. Feel free to substitute the chicken apple sausage for any other sausage you’d like (or can find on sale). Make it your own, and use what you have! Not done yet, just you wait! 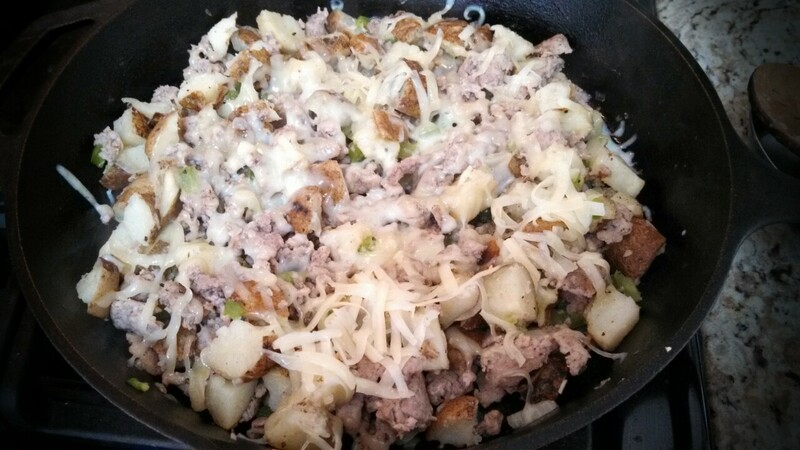 Add sausage to a pan (cast iron works great), along with onion and bell pepper. Break up sausage and cook until no longer pink. Add garlic, cooked potatoes and pepper, stirring until combined. Add shredded cheese on top, put a lid on it and turn heat off. To fry eggs, spray your non stick skillet with cooking spray. I use canola oil cooking spray. Heat on medium heat. When skillet is ready, crack eggs, season with a little salt and pepper, and cook on one side for approximately 2 minutes, flip over, and cook for a couple more minutes. Cook the eggs for as long or as little as you prefer. It just depends on how much you like the yolk cooked. 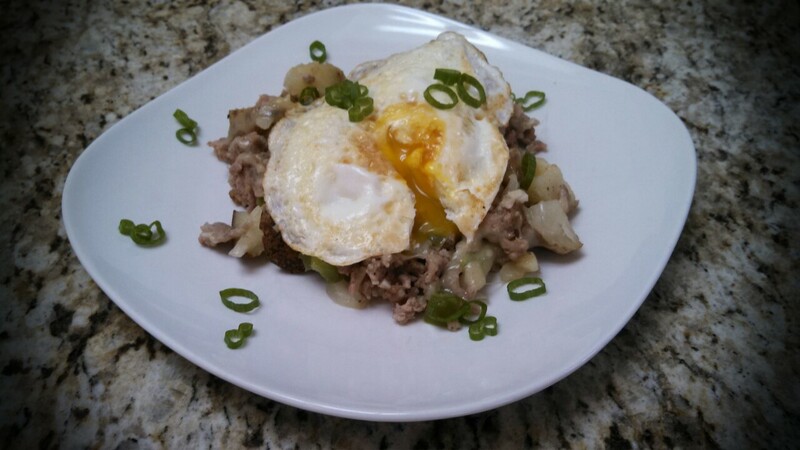 Scoop a generous portion of the hash onto a plate, top with the fried egg and sprinkle with the green onions. 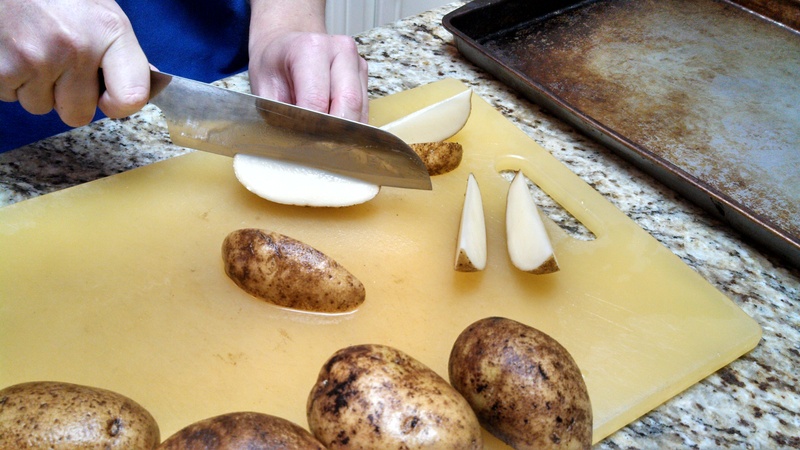 *Use your microwave setting for baking potatoes for this recipe. It takes much less time than actually baking them in the oven, and I always do this for any type of breakfast potatoes. Yes, I’m posting another “cheesecake” recipe. That’s because I had some leftover cheesecake filling from the no bake apple cinnamon cheesecake bites and there is no way I was letting that go to waste. If you don’t have any leftover cheesecake filling like I did, don’t fret! You can make a slightly simpler version to speed things along. Now, if you like sweet breakfast treats, then try this one out. I have a big sweet tooth, but of course, my kids have even bigger ones. Especially #2 (the one who doesn’t eat but surprisingly loves sweets). Hmmm…. Of course, right? So treat yourself and your kids to this delightful breakfast. P.S. It doesn’t even need syrup! Mix together the cream cheese, sugar and vanilla until smooth. In a separate dish, whisk together eggs, cream and cinnamon. And in another separate dish, add flax and almonds and mix together until combined. Heat a griddle or non stick skillet over medium low heat. You can either spray with canola spray (my preferred method) or melt coconut oil or butter. Take a piece of bread and add 2 heaping tablespoons of cheesecake mixture and spread around evenly. Place another slice of bread on top. 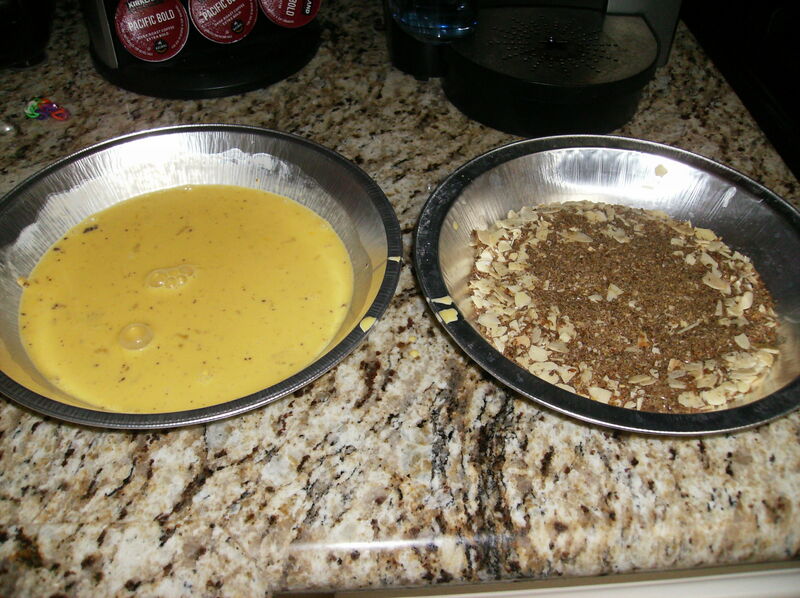 Dip into egg mixture, making sure to flip over and coat both sides. Then add to the flax and almond mixture. Put the “sandwich” on the griddle. Cook on each side for about 3 minutes. This will just depend on your stovetop. You want the exterior of the bread to get a nice toast on it. So yummy that it’s pictured a second time! Cut each “sandwich” in half diagonally and place on a plate. 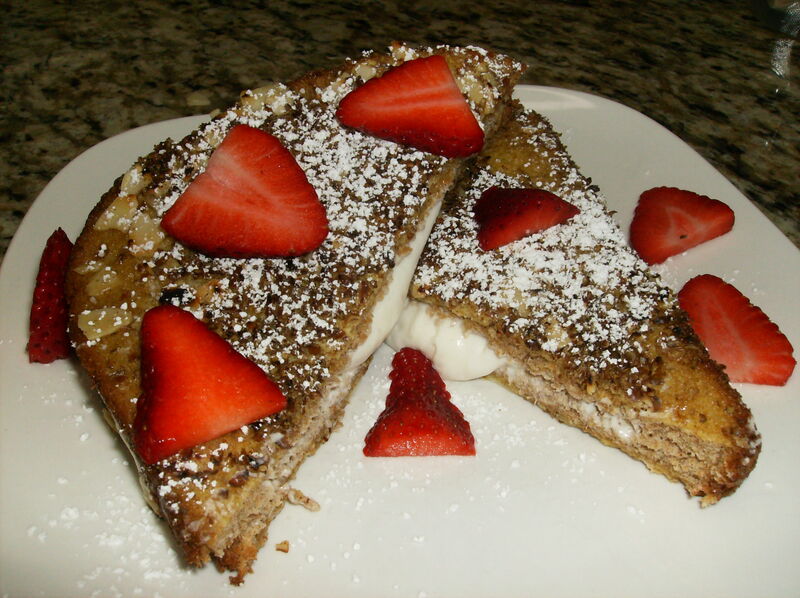 Garnish with some powdered sugar and sliced strawberries. Lick the cheesecake filling as it oozes out. Dig in! *This recipe will leave you with leftover cheesecake mixture. Do with it what you must, whether it be dipping strawberries into it, eating it by the spoonful, etc. If you do not want leftovers, cut that part of the recipe in half. I heart dessert! I love eating sweets, but not so much baking them. Not to say I don’t bake, but I just don’t enjoy it as much as cooking a delightful dinner. But this dessert is no bake, so it’s perfect for the “non baker” in you. This is a super cute dessert that is great for serving to company. It looks pretty and is easy to eat. 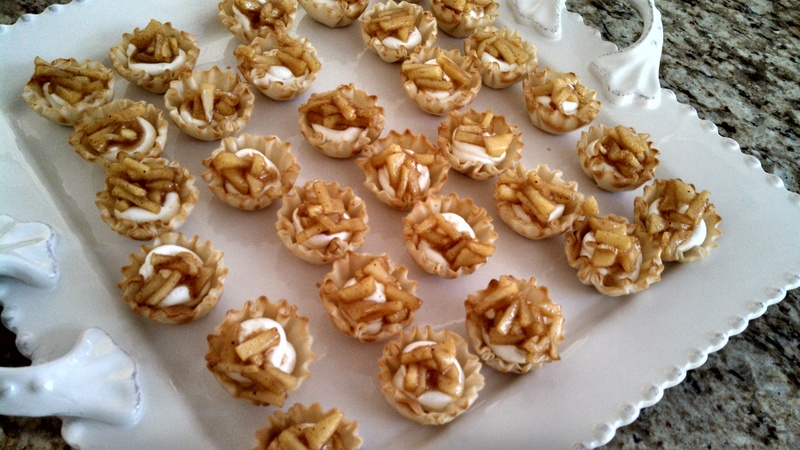 These mini cheesecakes are a perfect combination of crunchy, sweet, tart, all in one little bite. 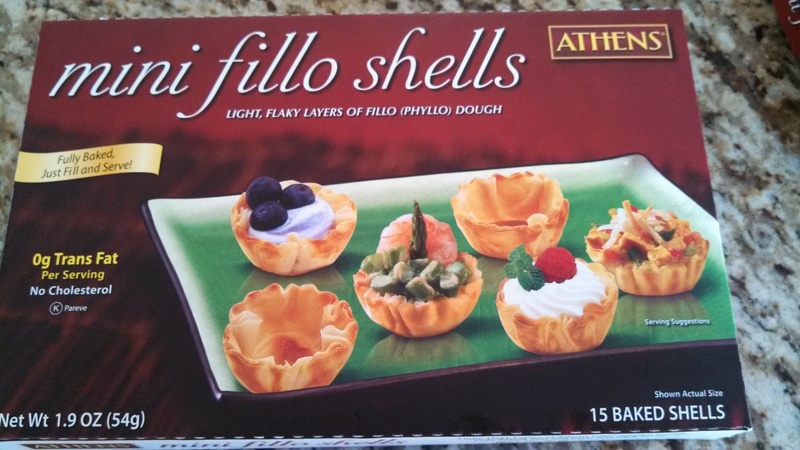 Thaw mini phyllo shells. Optional, if you’d like them extra crispy, bake at 350 degrees for 3-5 minutes. If not, just let them thaw. Set aside. Melt butter in a saucepan on medium heat. Once melted, add apples and sauté for about 4 minutes. Add brown sugar, cinnamon, nutmeg and lemon juice. Stir together and once it’s melted and gooey looking, turn heat off and let cool. Add cream and sugar to the bowl of a stand mixer (if not a hand mixer will do) and whip until cream has nice soft peaks, about 3-4 minutes. 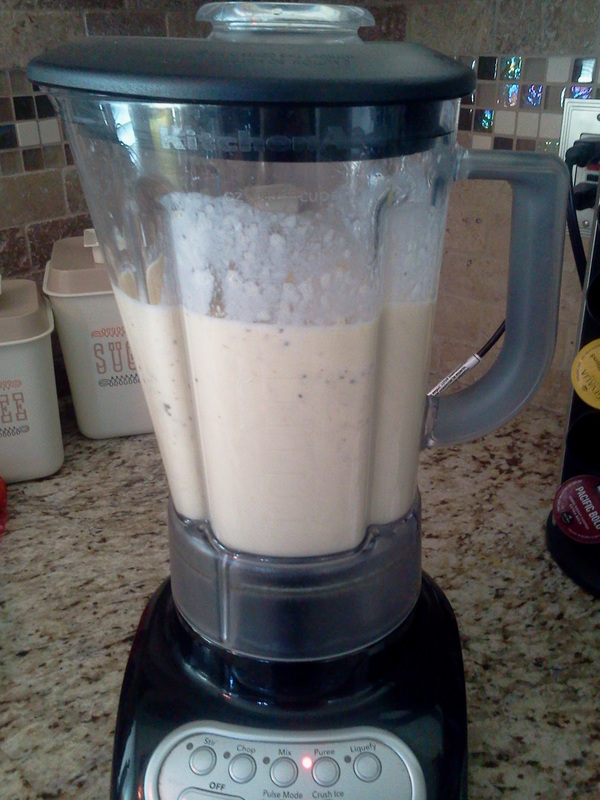 Start off slow and then up it to a higher setting (I use a 6 on my stand mixer).The cream should look silky and soft. Let it go too far and it starts to look chunky and heads toward butter.Set aside in the fridge. Fold in the whipped cream and be gentle! 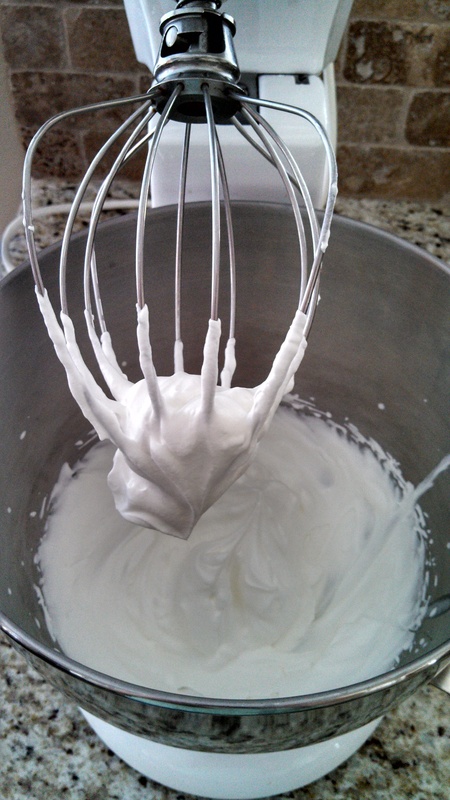 Add cream cheese, vanilla and sugar to the bowl of a stand mixer. Mix until the cream cheese is smooth looking. 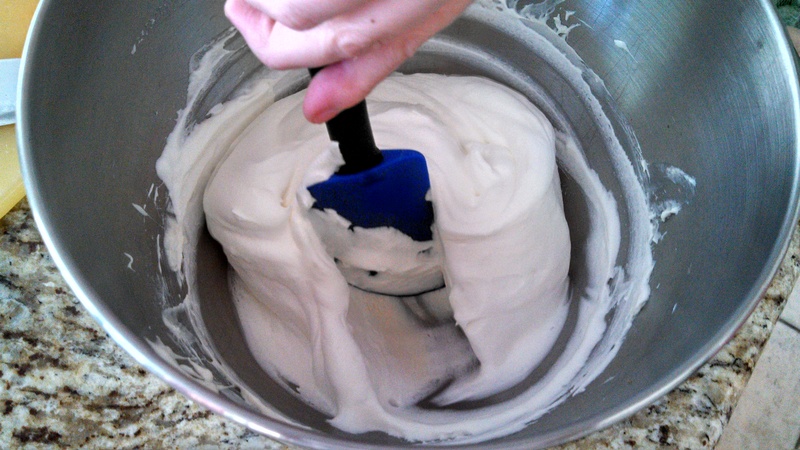 Add whipped cream to cream cheese mixture and fold together. 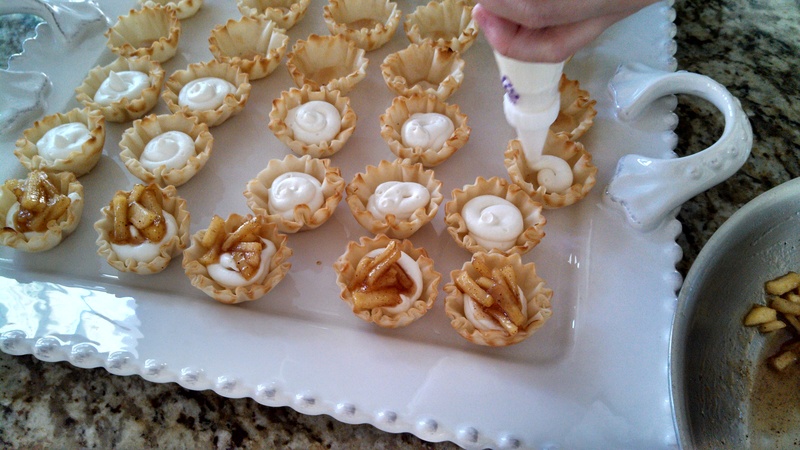 Once combined, add to a piping bag (or a Ziploc bag with a corner of the bag cut off) and pipe into the phyllo shells. 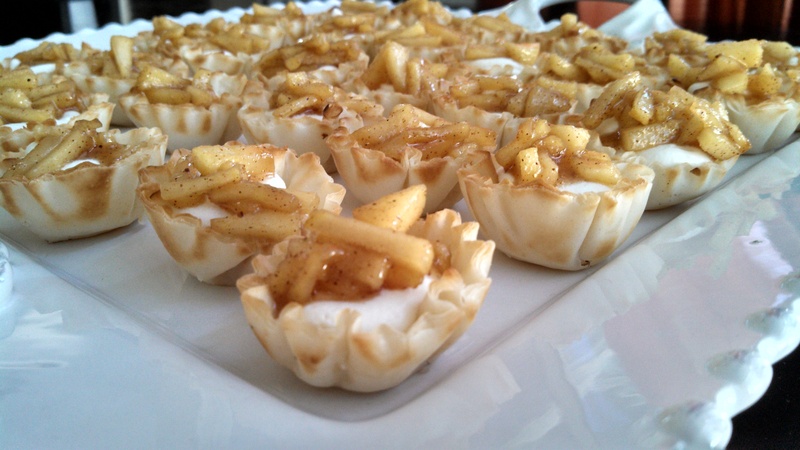 Add apple compote to the top and refrigerate until ready to serve. Ever had a Rubio’s fish taco? If not, you’re missing out! Hands down, they have the best fish tacos I’ve ever had. Most of their restaurants are in California, with a few nearby states also being lucky enough to have them. If you’re not fortunate enough to have eaten at one of these places, don’t despair! As I’ve said before, I love to re-create restaurant food at home, and this recipe pretty much hits the nail on the head. Not only can you use this beer battered fish for tacos, but it would also be great for a fish n chips dinner. Whip up some homemade tartar sauce and cook up my previously posted recipe for homemade French fries, and you’re good to go. That’s a good looking piece of fish! Back to the tacos. I prefer cod for these tacos, plus it’s on the less expensive side. And it’s mild, so if your kids are not fish fans, start them off on this. I also prefer a lighter beer for this batter. If you use a dark beer, that flavor will definitely come through more. Whisk the above listed ingredients in a bowl and refrigerate. Those $.98 Walmart squirt bottles also work great to put this white sauce in. 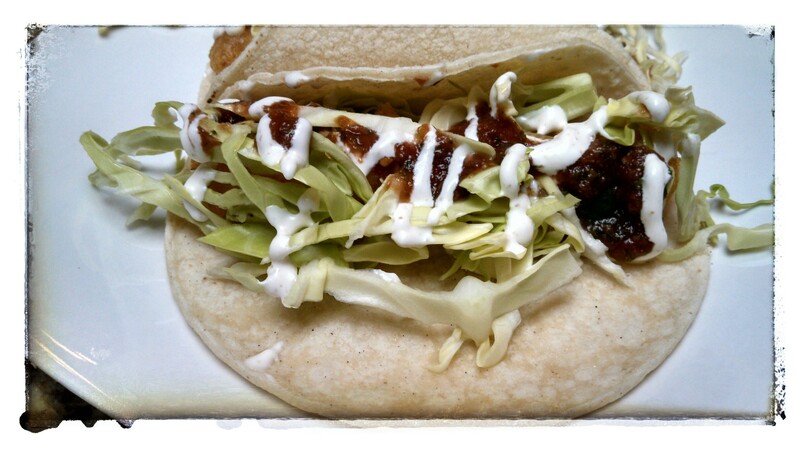 Plus, it looks purty when you squirt the sauce over the top of the tacos. Preheat a deep fryer. 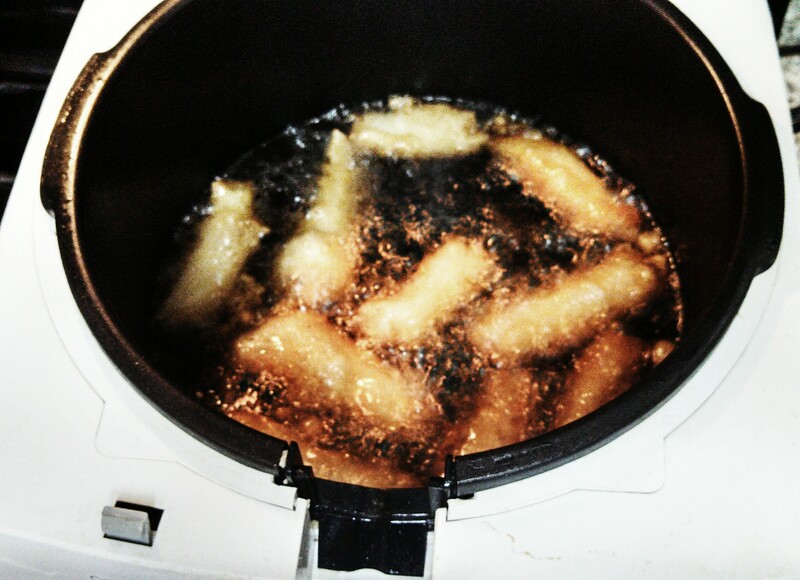 If you do not have a deep fryer, you can fill a pan or pot with oil, heat it on medium and go from there. Whisk beer batter ingredients in a bowl. Dip strips of fish into the beer batter, making sure to shake off excess batter. You don’t want a huge layer of batter, you want to taste that fish! Gently put the fish into the hot oil. You may need to do this in two batches, as you don’t want to overcrowd the fryer/pan. Flip the fish over after a couple of minutes. Fish fries quickly, especially if you are doing small strips as called for in this recipe. Fish will be done when it’s floating and golden, approximately 4 minutes. Set aside on a wire rack or paper towels to drain. Heat corn tortillas on a plate in the microwave, covered with a damp paper towel for 1 minute. Now it’s time to assemble the tacos! 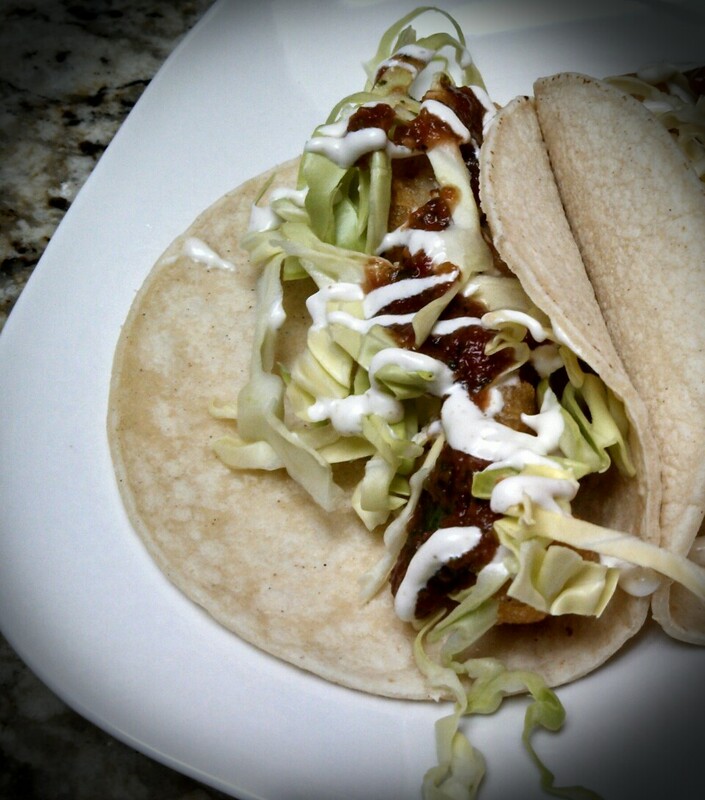 On a tortilla, lay one or two pieces of fish, squirt a little bit of the white sauce on top, then add the shredded cabbage, a little bit of salsa, and more white sauce on top. A squirt of fresh lime over the top and it’s ready to eat. You complete me fish tacos! I hope they complete you too!!!! Chili! 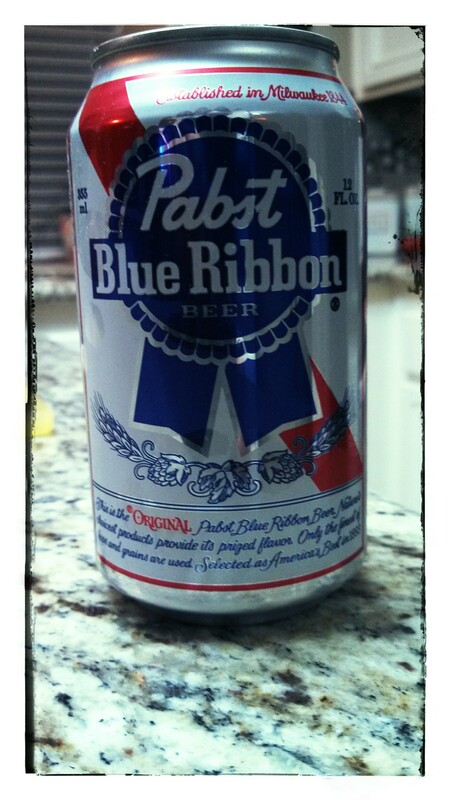 It’s all American! Traditionally made with beef, however, over the past year, my family has almost completely switched out ground beef for ground chicken. And we love it! 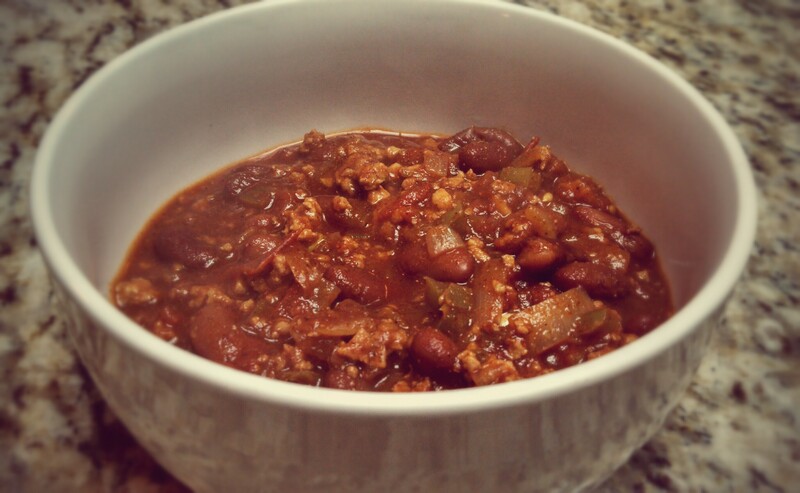 To tell the truth, I like this chili much better with chicken than with beef. I don’t know if Texas will allow me to enter their territory with that statement, but it’s true. 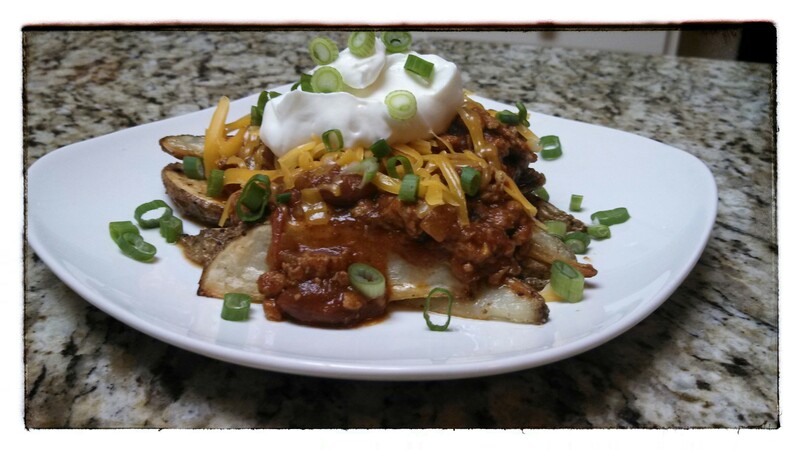 Whenever I make chili, I also make French fries because my kids are chili cheese fries fans. Say that five times fast. My fries are baked so they’re even healthier for you than the traditional fried version, plus they’re super easy. So for the kid in you, see the recipe for my homemade French fries down below. 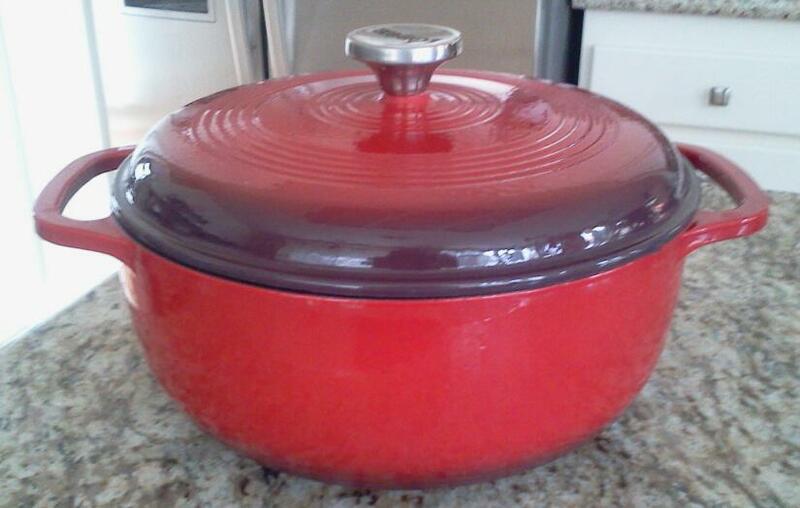 This is a real dutch oven, not the urban dictionary definition! In a dutch oven (or large saucepan/pot) heat oil and add ground chicken. Stir and break up the chicken, adding the onion and bell peppers. When chicken is cooked (it will no longer be pink), add the rest of the ingredients. Stir and bring to a boil, then reduce heat. Simmer uncovered, stirring occasionally, for approximately 45 minutes or until thickened. *If you don’t have a dutch oven, I highly recommend investing in one. They are ideal for soups and shredded meats and are great because they can be used on the stovetop and then transferred to the oven for further cooking. *If you are a spicy chili fan, you can use a spicier chili powder and also add more hot sauce. Preheat oven to 450 degrees. 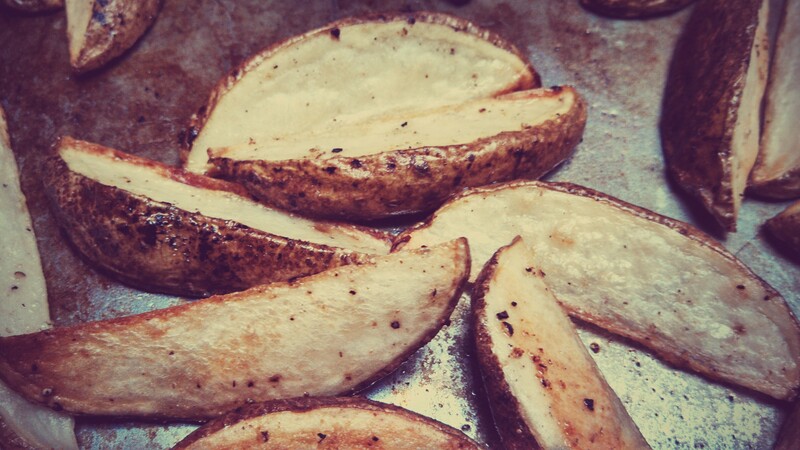 Place your potato wedges on a baking sheet and pour olive oil over the fries. Sprinkle garlic powder, salt and pepper over the fries (it’s up to you how much seasoning you want on your fries) and then using your hands, stir all of it together to get those fries coated. Bake for about 15 minutes, then turn the fries over. Cook for an additional 15-20 minutes. Fries should be crisp and golden.